Ultraviolet (UV) light can be applied to support numerous applications in a broad range of industries. In commercial paint spray booths and label manufacturing plants, UV lamps are used to streamline paint jobs and the printing of logos. Outside of such practices, the light source may also be utilized to eradicate harmful, disease-causing bacteria. Systems that rely on the light’s ability to disinfect the surrounding environment (surface and air) are mostly found in food processing plants and medical facilities. This article dives into the salient role that UV light plays in Heating, Ventilation and Air Conditioning (HVAC) systems. Read on to learn how UV rays kill bacteria and its effectiveness in boosting air quality. UV light can be broken down into three general categories: UVA, UVB and UVC. UVA (315-400 nm) is known for its tanning properties and links to skin cancer. UVB (280-315 nm) offers a less severe dose of UV light, compared to UVA. UVC (200-280 nm) is the range that inactivates deadly bacteria and germs, such as Salmonella, Listeria and Cryptosporidium. When microorganisms are exposed to UVC bands, they absorb the light and their DNA gets scrambled. It is important to consider that 250-258 nm is the optimal range for UVC disinfection (with an exposure rate of 400 J/m2). During application, the target area, object or surface must be exposed to UVC wavelengths in a thorough manner. This is because disinfection only occurs during this period; and unlike other methods (such as boiling water) the process does not carryover after exposure. 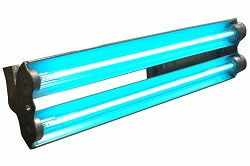 UV light is very effective in killing bacteria, due to its ability to inactivate microscopic bugs instantly. After the first wave of exposure, only a light dose of UVC is needed to finish off any microorganisms that may have survived the initial ordeal. In HVAC systems, real-time disinfection using UV lamps typically occurs in the ducts, as air passes through in the enclosed tunnels. Furthermore, such luminaries may also be installed near cooling coils and drip pans. To get the most out of the light, some individuals install reflective surfaces in the walls surrounding the light source. A vital component that determines the effectiveness of UV disinfection in HVAC systems is air flow. In particular, slow-moving air is preferred for thorough application, compared to fast-moving air. Stagnant air is also not suitable for UV disinfection; and as a solution to such inadequate factors, operators may install fans to promote air circulation. When UV disinfection was introduced to the HVAC sector, many groups questioned its effectiveness. Several years after, researchers published a handful of case studies that proved the viability of UV irradiation in HVAC systems. One of the most pivotal studies came from Duke University Medical Center. In 2012, the facility installed UV luminaries in over 50 hospital rooms. The lamps were specifically deployed to eradicate bacteria with drug-resistant properties (Acinetobacter, Clostridium difficile and vancomycin-resistant enterococci [VRE]). The team installed a machine with eight UV fixtures that were centrally mounted and optimally positioned for UV treatment. Researchers tested the efficiency of UVC light in the HVAC system and found that the fixtures disinfected up to 97 percent of microbial germs that passed through the light. During examination, scientists took samples from numerous “high-touch” locations in the rooms. The results showed a significant decrease in colony-forming bacteria: CFUs of Acinetobacte fell from 52 to 1; and CFUs of VRU fell from 719 to 15. The conclusion of the study asserted that such applications in medical facilities could help reduce hospital-related infections and outbreaks. During the study, researchers observed the UV lamps that were installed in a 286,000 square-foot building located in Tulsa, Oklahoma. The fixtures targeted the following types of fungi: Penicillium corylophyllum, Aspergillus versicolor, Acremonium spp., Cladosporium cladosporioides and Cladosporium sphaerospermum. After the four-month study, scientists concluded that harmful fungal build up was significantly reduced with the introduction of UV luminaries in the HVAC system. The effectiveness of UV light in the treatment of contaminated air strongly relies on proper installation and best practices. For example, in UV HVAC coil sterilization, a tube-shaped UV fixture is installed at the return air duct, where it disinfects the air handler coil. This method involves leaving the light on 24/7. Light replacements for such setups will need to be conducted on a yearly basis. In UV HVAC air sterilization, the UV lamp is also installed in the return air duct. But unlike coil sterilization, the fixtures are strategically positioned with the air handler blower component. As mentioned earlier, low-velocity air is optimal for this type of UV treatment. Because the lamps must be operational for long periods of time, it is important to use UV light sources that are long-lasting and durable. Without a doubt, UV LED lamps offer significantly longer lifespans, compared to traditional light sources, such as metal halide, fluorescent and incandescent bulbs. LEDs boast up to 50,000+ hours of light and consumes very little energy during output. Lastly, for a thorough approach to air disinfection, individuals should consider deploying other types of air treatment methods that can support UV-disinfecting luminaries, such as air filters and consistent maintenance of HVAC components.